Hailing from Finland, Mørketida present us their debut album which, unlike most of the festering horde laying claimant to the precipitous banner of black metal this year, has some actual merit. 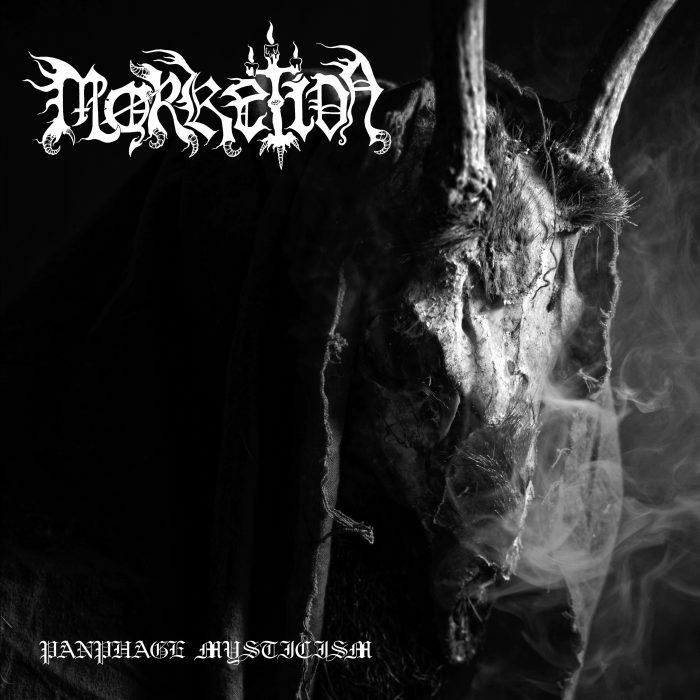 Perhaps what is most impressive about this release is that, despite its utter reliance on the most elementary of black metal chord and note progressions, there is such a wealth of depth in the interplay between elements that the essential lethargy and entropy prototypical of the modern form of this threadbare genre is fully exceeded. Verily —and in traditional, true black metal fashion— they have made the utmost out of rudiments. Every section here is wrung out, thoroughly, meticulously and by means of layering, coalesced into a microcosm of sound. This is aided by the production’s overlaid murk, an intensely atmospheric affair; manifold veils reveal obscured information upon close inspection, in this way taking its cues from early Burzum. Indeed, most parts of this album can be traced back quite easily enough to the cornerstones of the genre. As mentioned before, the language that makes up the barest essence of this genre is present here in full force and yet that language has been twisted to fit its needs, to create an experience. There is no concession to vanity here, all is arranged in service to a pervading darkness and this puts the craft of this album above most. In this way, it is true, it has not simply regurgitated the requirements of the genre but used them in expression. Traces of Darkthrone, Gorgoroth, Graveland, Ancient and Burzum, all make appearances here, though not in imitation by any means. These classic bands have indeed scribed the language but the arrangement and order of its morphemes is fully Mørketida’s own. A deliberate brooding pace sets the tone for much of this album, at times finding brief resolution in well-worn, thrumming tremolo bursts, hallmark of the Norwegians. Drums too, are played in the classic way, wisely devoid of any clutter they rumble, blast and accentuate without syncopation, pure in that they do not attempt to suffer arbitraries upon the listener. Vocals chant in intonations obscure, oft buried in the umbrage and at times barely discernible, only made known by their echo, like chanting heard from a cave some distance away. Some brief sections of keys, emphasize moments of power or ambience, they are present in much of this album however, usually as another layer in the foggy production. In its most fervent moments, there is force of passion here, etched out as sharp contrasts between the meandering stride. The brunt of this work appears uniform with its slow chords and droning arpeggios but sections are arranged in repetition only with the greatest patience, never failing to end that which has dwelt too long. In fact, this album is utterly untouched by the inertia of lingering thought-forms past their day; all sections have been measured diligently and like the ancients they shift when it is time, never after or before. This organic sense of composition is much missed in these days of note clamor, where the essential power of the black metal language is roiled by the entropy of an unnecessary, incessant changing of riffs, vomited out with little application of artistry. Songs are well wrought, there are no loose ends to composition and another impressive facet of this release, there is no excess of vanity, no flirtations with extraneous influence. The uniformity of this approach, with just enough discernible waymarks to keep the listener guided throughout its realm, lends a rare strength to this release. Very few parts make any attempt to be seen as indelible, and of these, the title track in particular sets itself apart by letting the bass wander, exploring different trails and in one glorious moment lets it solo, a longing sonority against the melancholic scratching of the guitars. Moments like this one are rare and with good reason, this is the type of black metal that longs to dwell in worlds away from modernity, it crushes the ego, it spurns the trappings of the mundane. The goal of a permeating, consuming, crepuscule is always in mind and with it; the apprehension of an atmosphere pure, reveling in its fealty to an ultimate darkness. A mature and conservative work in all aspects, what may at cursory glance appear to be contrived or unremarkable will soon prove itself well worthy of study. Experience it as a whole and experience it with headphones!